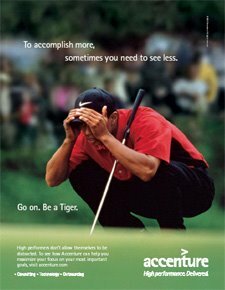 In consulting circles, it’s been hard to meet someone in the past few weeks without cracking a Tiger Woods and Accenture joke (“Infidelity. Delivered.”) Given the rising tide of jokes tied to the Accenture brand, it felt like it was only a matter of time before Accenture pulled the plug on its marketing relationship with the golfing legend, a partnership that was linked at the hip with the firm’s overall marketing strategy. From PowerPoint presentations to boozing it up with top clients at The Masters, Accenture practically defined its entire marketing efforts around Tiger’s image. It was clear that Tiger’s sourcing approaches left much to be desired — this is someone who should know the difference between the “strategic” quadrant vs. the “leverage” and “automate” ones in a sourcing 2 by 2. Or we would hope. “Go on, be a Tiger” would now work well when selling to 20-something aspiring male executives –- but fails horribly when not accompanied by Viagra when pitching the typical Accenture middle-aged clientele. We should all know the supply risk involved in having too many suppliers at one time –- especially on a global basis. Tiger’s focus on multi-echelon push vs. pull (or was that supply vs. demand?) -driven supply chains ran counter to the lean thinking espoused by Accenture on the subject. Accenture partners, who are known to have a high divorce rate (like partners at all major consultancies who are on the road non-stop), did not want to be reminded of their own situations. Moreover, they did not want to be reminded how much fun they might have had prior to getting divorced versus simply being away from their family 200+ days per year. Accenture’s supply-chain group was upset that Tiger was not rationalizing his supply base properly when it came to his dalliances. Accenture’s strength in installing “relationship partners” in key accounts runs counter to a transactional sales approach implied by Tiger’s behaviors.